The Labino Nano UV 375 UV LED Torch Light is designed for security applications such as analysing Documents and the detection of DNA Based Tracer Liquids (SmartWater) but it is also used for some leak detection applications and suitable to detect LabinOil. The Labino Nano UV 375 UV LED Torch Light is developed for fast analysis of documents by patrol police as well as customs / police officers. The design is very small and light and can easily be fastened to a belt, using the included belt holster. The most common applications for this torch are ID controls, document analysis, Smart Water and invisible ink. This extremely compact, lightweight and affordable UV-A LED flash-light operates with a peak wavelength of 375nm. The Lamp measures 11.1cm long (4.4 inches) and weighs 114 grams (3.8oz), battery included. The Labino Nano UV 375 Spotlight produces a narrow intense ultraviolet beam measuring over 2,000 µw/cm² (20W/m2) at a distance of 38cm (15 inches). The centre of the light beam is 40mm (1.6 inches) diameter, at a distance of 38cm. The Visible light output is <40lux (3.7fc). The Labino Nano UV 375 Midlight contains one (1) ultraviolet light emitting diode (LED). This particular wave length is also suitable for different kinds of leak detection. Full Power is reached instantly. The Nano UV 375 is equipped with a current regulator to keep the intensity stable when the battery fades. The on/off button is positioned in the back of the lamp to prevent accidental activation. At full charge the battery provides approximately 35 minutes of use (constant). 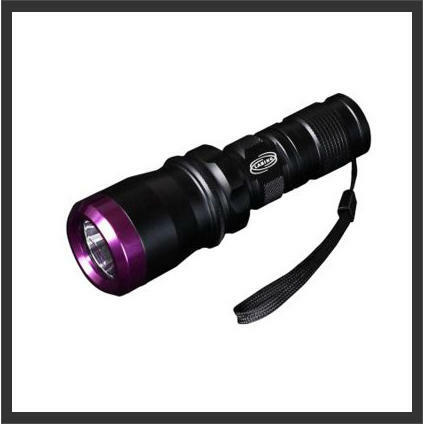 Manufactured in a durable aluminium casing.